Well the South brough some relief to the sea and it is looking cleaner that yesterday, but I am still not too sure how clean it really is. The unfortunate thing is that the north east will be up early and we might have to wait until Sunday to get in. 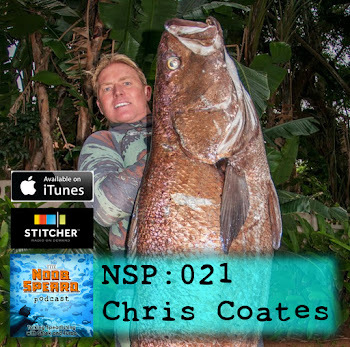 Other than that there is a new website on the scene, www.spearo.co.za/ created by the guys who brought us the Fishing Corner this is bound to be a hive of activity in the months to come. Is ita Malloway or Dagga Salmon? Here is an interesting question: is a Australian Mulloway the same thing as a South African Dagga Salmon or Kob?? Both the Mulloway and Dagga seem to be the "Argyrosomus japonicus" from what I have read. Although the Argyrosomus hololepidotus is found along the South African, Madagascan and East African Shore lines. It is more commonly found in shallow water and is listed as endangered. Prahaps that is why shore anglers have a restriction on Dagga on our coast? Here is a South African Dagga Salmon or Kob, or is it a Argyrosomus hololepidotus? Let me know your thoughts ...just add a comment below. What a brilliant day! I had a couple waves before work, one or two small barrels and a handful of beatings ....quiet common these days with me!! I must be getting old and slow or something ?? Anyway the sea was great this morning, the swell was not as lined up as I thought it would be and the surf consisted of freaky peaks. But the conditions were so good, it made up for the inconsistent waves. The vis was not as good as I hoped and I think we will be surfing again tomorrow. The forecast shows the swell to still be around for tomorrow and then the east will blow ....typical! No one likes to miss out! After a couple of average dive this weekend I was planning to get in this morning with the improving conditions. But i was awake from 4 bells thinking about work!! can you believe it. So I got up at about 5 and went to the office, the whole time I was stressing that I had made the wrong decision and should have gone diving. So at 6:30 my I could not contain myself and shot down to have a quick look ..... and it was marginal at best, what a relief - the last thing I wanted was to know that I missed out!! The next few day look good for some surf and even a couple dives later in the week. There is hope for tomorrows dive! There is a nice little south west due today and this will hopefuly clean things up a little. I was on the road yesterday arvo and Tongaat did not look all that bad even in the east. The East will be up early and I am sure the sea will turn ugly quickly, so get in early!! 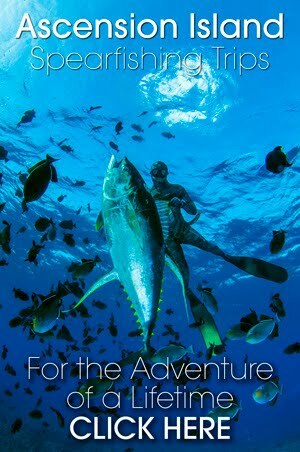 I hope you had a chance to Visit our new Spearfishing Video DVD web site?? If you have not yet ..go on ...I will be putting u some sneak previews this weekend! 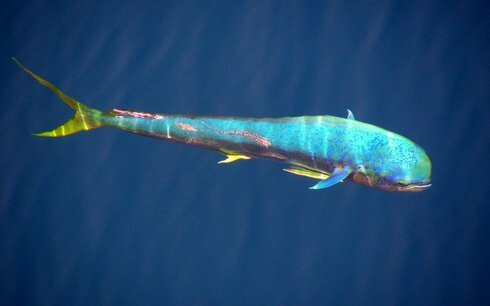 A mate sent this "Eye Candy" of a Dorado to get my juices flowing. This pic was taken from the boat .. flip how clean is that water?? You can see the sand underneath the fish!!! Fujian Dorado - freeswiming - makes you want to go dive!! Behind the scenes over the last few months we have been working hard on what we like to think is going to be the best Spearfishing DVD on the market. Just looking at the 'rough edit' - (the basic story line before we add in the graphics and music) I get so excited. I want the dvd to be ready now. So far we are 3/4 through the main Spearfishing Adventure and are busy putting all the bonus features together. It wont be long now, and we hope to have the dvd finished by November. We have put together a website that will cover our progress as we get to the final moments before the launch. We will be putting up some sneak previews and inside info, so be sure to pop in every now and then and see what is happening. Well we had a couple waves yesterday and the sea was not looking to bad for a dive. The swell was a little on the big side, but not undiveable. Anyway I will have to wait for some news from Oz or some lucky bum on a island some where. Come to think of it Scotty Rutherford is in G-land .... he took his speargun in his board bag!!! Maybe we will have some pics to show next week. 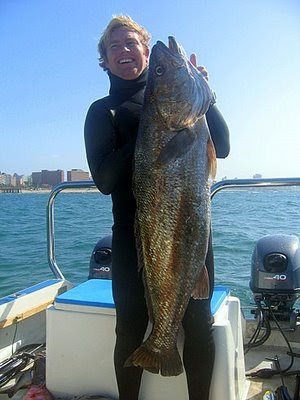 You know the old saying the grass is greener on the other side, well spearfishing in Oz does seem to be flipping rad! I got a report in from Barry Paxman on there weekends diving. They got some Spanish Mackerel 'Cuta' around the 24-25kg mark .... obviously not that impressive, as they did not send pics. I would have the pics framed and on the wall for all to see!! Maybe the cuta got left off in the light that they got a Cobia 'Prodigal Son' of 35.75kg and a Yellow Fin Tuna of 34.6kg!! Here is Scott Paxman, this guy just seems to be getting great fish. The not so long ago we saw those great Wahoo they shot ... Check it out .. Paxman Wahoo Its no wondr he has been diving since he was ...um .... probably 3yrs old or something! Scott Paxman 35.75kg Cobia. A.K.A Prodigal Son. I finally got in the water today, I heard that it had cleaned up and a mate of mine got a good sized snoek off Westbrook. I hopped in at Tiffs at first light only to find the water green. But with about 4m it was good for snoek. I hung around the inside looking for snoek when the swell started to pick up and I headed out deeper. I got the surprise of my life when a cuta swam right up to me, it was a real good sized fish. i turned to line up and it spooked, disappearing into the gloom in an instant ....flip I was so bummed!! The west is pushing and the morning shows some promise, lets see what happens. The Surf fired on Monday with most spots having some kind of a wave, but its back to slop again. That said today and tomorrow have very light winds and there will probably be some surf or a dive in the shallows. But as for me ... I am in the office working!!! Well its monday and the surf is pretty good, I decided to go surf Sunrise and got schooled. After not surfing for a couple weeks and being undergunned I got worked properly!!! It was a solid 5ft on the sets and I paddled flat out against the rip the whole time only to be out of position when the sets came. When I did get into a wave it was air drops and head slams!! ....fun!! The guys surfing Bog on the other hand seemed to be having more fun. The wave was actually quiet good, a bit shifty but every odd set had a pearler. Go check out Resurrecting Bog Bay ... we are trying to get the rock moved to improve the wave!! I heard from Morne' and Willy who are up in Mozambique, they are getting some good fish. Nothing big yet but a couple of Kingfish around 12kg and some good sized Cuta around the 14k mark. Unfortunately Morne has burst his ear drum!!! freak that must be a serious let down ... Mozam and a screwed up ear!!! I dont think it gets worse. The East is going to mess things up later, but with a little luck the sea will still be ok tomorrow! Well now you can take part in just such a spearfishing competition. The objective is to have many competitors enter and participate. All registration fees of R80 per person go to sponsoring our Springbok team taking part in the World Championships in Venezuela in October 2008. In the Online Open you can dive in different areas and compare catches as a percentage of the SA record, this allows someone shooting a big butterfish in False Bay to compete against a 40 kg kingfish taken in KZN. Who can take part? Anyone with, or without SAUFF membership, you do not need to be a club member, foreigners welcome too if you are in SA. When? Diving between 1 September 2008 and 30 September 2008 - daylight hours only. You should be able to get a few dives in during that 1 month period. Where? Anywhere in South African ocean waters - excludes reserves, dams, lakes and estuaries and any spot you may not dive legally. Fish Species that may be taken: Any open season fish - excludes closed species such as brindle bass, Natal wrasse etc. Excludes sharks & skates. Scoring: To allow divers in the Cape to compete with those of Natal the scoring will be based on record percentage. How does record percentage work? Weigh gutted fish with gills removed. Weigh your best five fish(highest record percentages) and submit the pictures as specified by the weigh-in rules(to follow). The record percentage of each of the five fish will be totaled and the person who gets the highest score is the overall winner. Get a fish or preferably five this September. All you do is take a digital picture in the manner required(supplied later), record the weight accurately as possible and email the picture to the judges as evidence. Shane of Freedivers offered to sponsor a Freedivers Speargun and a pair of Freedivers Fins. Gletwyn Rubidge (me) has sponsored an online spearfishing mentorship program, a correspondence spearfishing course, twp Len Jone’s Books and a CD divebook on PE divesites. So far that’s about R3000 worth of prizes. Other sponsors are welcome to donate prizes too. There prizes for individual fish with the highest record percentage. Do something different this spring and support our boys in Green and Yellow. The system is open for registration right now! The sun is not up yet and I am sitting in front of my pc!!! And with today been the only guaranteed day when the sea will be diveable ...I am bloody mad! There is a south coming today and could push some swell for tomorrow, the weekend has strong southerlies and with a big swell building until Monday. We will probably surf Monday morning with 3m plus waves, it will probably be all over the place as we normally need a day of calm winds to settle the swell. I have recently started a new web page called "Resurrecting Bog Bay"
For years we have been talking about doing something about the rocks that stop the flow of sand into the bay. So here is a start, the site is dedicated to collecting info on the beaches before and after the rocks were put in almost 20 years ago ... freak that makes me feel old!! Please take a look at the site, if you were around then or surf up the coast please join the site. You get access to the forum and your own profile page were you can stick up pics and write your own blog. But what I am really after is old pics of the beach and to try and get in touch with some of the older folk who used to surf there back in the day. Well its a lovely day in Africa, the sea is clean the sun is shining and 80% of the country is on strike!! That means some of the mates are taking the day off and enjoying the bliss. I went for a quicky and got a Grunter of about 5kg, and saw a baby Dagga. There was abit of swell so I am sure the guys got some waves aswell. In fact when we got to the beach a mate of mine was there with his fishing ski, telling us how much easier there are compared to swimming out. After 4 tries he left his ski on the beach and swam to the spot. Never the less we beat him to the spot and there was a little jesting going on about the ski story. ..... every man for his own I suppose!! 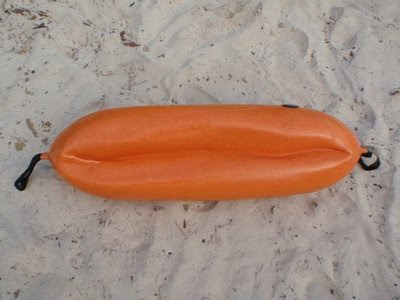 Here is something amazing .... Eric Allard who shot that awsome Dog Tooth Tuna up at Tanga also sent this pic of his Rob Allen Roto Moulded Foam Filled Float that got crushed when the Doggie took it down. Rob said that the float is designed to be able to handle 40m with no effect on the buoy. Read Erics response to Rob ...very interesting!! Rob Allen Roto Moulded Foam Filled Float, crushed at 60meters. I may be off by 5 m at the most on the depth of the second float. It was down there with line fully extended and no less than 10 m from the surface (if not 15 m), so the depth the first float was at must have been somewhere between 50 - 60 m down. The fish was in Tanga. It is my favourite and most productive Tanga spot about 5 nm offshore, and about 1.5 nm off the outer reefs (so about 3.5 nm from shore to the outer reefs). I start my drifts where the bottom is about 100 m (it drops fast to below 120 m further south from where I get in the water, and am not quite sure how much further below that still further south) and drift onto a shelf that flattens out at 38 - 40 m. This has been a very very productive spot and is where I have speared several yellowfin in the years past, when the mantis prawns were around until 2004, plenty of wahoo, my black marlin, sail, and where I have seen these doggies before. The problem there is that the doggies don't seem to be interested in the flashers as they are at Latham (that is what was so amazing at Latham, as they come right up to the flashers in schools from a bottom of about 50 - 70m). The current heads north and there are thick schools of unicorn fish and rainbow runner right on the slope. 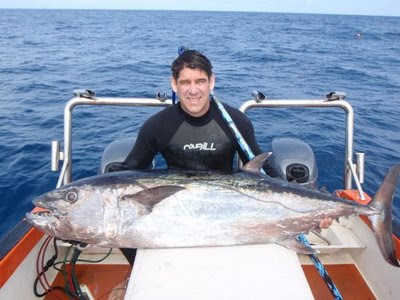 Before you hit the slope, and throughout the drift (which is about 500 m long from the time you get in the water to the time you get back on the boat) it is likely to see the wahoo. As you hit the slope, you dive into these thick schools. The water can be as clear as 40 m viz, and normally no less than 20 - 25 m (or it is just not worth diving there as the wahoo will not be there and you aren't going to make it to the bottom and shoot bottom fish, or even the doggies). I have seen the doggies there before just sort of idly 'hanging around' between the schools of smaller fish, well out of reach. The last time I saw them they were simply too deep down, as they were on the slope so probably below 40 m depth. So it is very likely this fish, in its initial run, went down the slope and into 100 - 120 m of water. The rear float was down at least 10 m for about a minute as I swam after the rig trying not to take my eyes off the disappearing float. The rear float then came back up and I followed the fish for quite some time. It never died until I brought it to the surface almost an hour later, now in shallower water (it swam north west and toward the main reef) and at least 1 nm away from where I speared it. It was a long so not a good shot and the spear never went through. I was very conservative at brining the fish up, so took my time ensuring that every time it wanted to run, it could without any extra jerking motions. Sure enough when I grabbed the fish the barb was visible just under the skin (but by then I had a second shot in it). I was lucky. This fish did not die or completely tire itself out after the first few runs like the ones in Latham did, but they were better shots. I suppose the good thing is that the float still worked, it did its job and the fish was landed!! I wish I could tell a story of how a big fish pulled my float so deep it crushed it! With enough time and money, I would be an 'excellent' spearfisherman!! Fact is I am just not going to spearfish a Dog Tooth Tuna here at home. Damn, I am Jealous!! How is this epic tuna Eric shot? Apparently it pulled his buoys to some ridiculous depth crushing a foam fulled float. A mate of mine Andrew is going to visit him in a months time up in Tanzania..... it is a real pity he does not need me to carry his suit cases!! Back here at home the south should come through later and sort things out for tomorrow. On Saturday Morne' I went spearfishing with Garrick Morris & Iain Ewing off Durban. I have not done too much diving in that area so I was quiet keen to see what was happening out there. The water was quiet good and it was still atleast 10m vis 20-25m down. I was filming some bait fish on one of the wrecks when a good shoal of Dagga Salmon came in. I saw some good size fish in the shoal, and took a shot at one nearest to me. One in the bag is better than one in the bush ....! The great thing was is that the footage of the shot came out great and it was a good call. Although the water was clean it was quiet cold and we struggled to find other quality fish to shoot. We dived up at Umhloti for abit before heading back. The water this morning was very clean, but again on the cold side. I did not see anything worth shooting other than some Yellow fin Tuna that came whizzing past my flasher ....all they did was get my heart pumping and thats about all. The east is going pump today so tomorrow might be out. There is a small south tomorrow that might sort things out again .... lets hope.